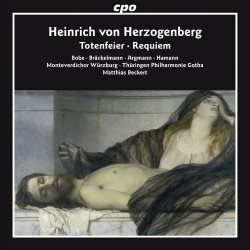 After establishing its Herzogenberg credentials with a disc of the first two symphonies in 2007 (review) CPO now comes up trumps with two major extended choral works. A contemporary and well respected friend of Brahms, this Graz-born aristocrat bears his Brahmsian colours on his sleeve. This aspect is in harness on this occasion with the joint themes of death and reverential hope that arch over all three works. Totenfeier seems to have been what we might cringingly call a 'coping mehcanism'. It was written shortly after the death of Herzogenberg's wife, Elisabet von Stockhausen, at age 44. She had been a piano pupil of Brahms. The music casts a resilient spell that speaks of both consolation and redemptive confidence. The work sets six passages from the Bible and three other religious-themed texts, Each has its own track. We start with a funeral march. This music is not fierce. It lacks the roar and growl of Brahms' First Piano Concerto. Instead it is more akin to the soothing intimacies of Brahms' Second Symphony. All the soloists are effective. They range from the ardent tenor, Maximilian Argmann (tr. 2) to the sweetly ascendant soprano of Franziska Bobe (tr. 4). The latter appears in a movement already made special by soaring choral writing despatched with commitment and good taste by Monteverdichor Würzburg who are a strength across all three works. In Ich habe dich eine kleine Zeit (tr. 6: (I have left you little child for a short time) deploys the solo quartet with the choir. They are joined by a tellingly smooth solo trumpet in pages that are both Bachian and calmingly confiding. This is most impressively moving music - quite a discovery. That solo trumpet (the player sadly unnamed) also returns briefly in the final section (tr.9). Tr. 7 (When the Lord redeems the captives of Zion) brims with sanguine rejoicing. Next comes the Dvorak-like woodland delights of the soprano aria: How lovely are Thy dwelling places. In the final segment Herzogenberg resists the conventionally stultifying fugal pull of such moments and the work dies away in peace and smiling contentment. Begräbnisgesang is for tenor, men's choir and orchestra. It's a short piece that could, in its touchingly solicitous mood, have fitted amid the movements of Totenfeier. It was written on the occasion of the death of Bach scholar and friend of Brahms, Philipp Spitta. It sets words of consolation written by Herzogenberg himself speaking directly to Spitta's widow. My speculation, but it seems to carry the additional conviction of a man who lost his own life-partner just three years earlier. Philipp Spitta and his brother Friedrich played a large part in Herzogenberg's life and musical creativity. The Requiem is on CD 2 in CPO's single width case. It is in six sections: six tracks. There is a choir and orchestra but no soloists. The movements are: Requiem, Dies Irae, Offertorium, Sanctus, Agnus Dei and Communio. All these works date from the 1890s so it is little surprise that they share a closely related language. The Requiem episode instantly enters with music of smoothly undulating choral contours. There is nothing profane here. It is all most beautifully done but is by no means somnolent. The Dies irae, intriguingly enough, is the longest section at 16:04. It begins in a low key and prayerful mood just like its predecessor. Deep in the texture there is the grumble of a distant storm from the drums. However there are to be no Verdian furies here even if Herzogenberg does rise to awe at the words Rex Tremendae Majestatis. The Offertorium is like a gentle supplicatory march drizzled over with honeyed sweetness - not in the least sickly. There is underlying fugal activity here but Herzogenberg's good taste fends off fustian academicism. Here and elsewhere the music is superbly sung while instrumental solo tendrils impel gentle forward motion. The Sanctus (tr. 4) is flighted by blooming excitement lead by the horns. This represents something of a public celebration and the music seems to be related to the more dynamic movements in Beethoven's Pastoral. After the quietude of an Agnus Dei the mood continues into the final Communio which speaks of universal themes of perpetual light and eternal rest. Herzogenberg's final benediction is unhurried and sincere. CPO meticulously prints the words for all three works - original text and fluent translation into English only. The useful and accessible liner notes (German and English) are by Konrad Klek of the Internationale Herzogenberg-Gesellschaft which also appears to have supported, or at least endorsed, this set. There are good long silences between sections and the sound is clear with plenty of detail and impact. I see that there is more choral Herzogenberg. I hope that CPO will not close the door on the possibility of further discs. If you like the Ein Deutsches Requiem, Nänie and Song of the Fates here is a composer under the smiling shadow of Brahms who lapped up the Hamburg composer's style and absorbed it without changing it unduly. Fingerprint after fingerprint shows through in these 100 or so minutes of music. Let that not detain or discourage you. The music speaks in genuine paragraphs and its sentiments are patently sincere. This music is about as far removed from our world of ceaseless Facebook crassness and twittered superficiality as it is possible to get. Here is a German romantic composer who thinks and grieves in long expressive paragraphs.